The Oilholic has exchanged the blustery wind and rain in London for the blustery wind and rain in Vienna ahead of 163rd OPEC meeting of ministers here on May 31, which half the world’s media and energy analysis community have already dubbed a ‘non-event’. The other half are about to! Industry commentators here and beyond think the 12 member group is going to hold its current production quota at just above 30 million barrels per day (bpd). 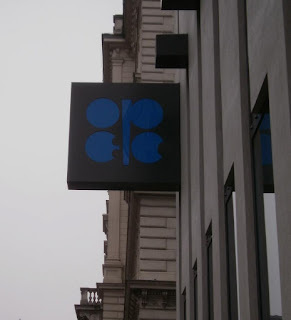 Even before yours truly boarded the flight from London Heathrow, a Rotterdam based contact in the spot trading world suggested one needn’t have bothered with the market having already factored-in an “as you were” stance by OPEC. This is borne out in further anecdotal evidence; the futures market on leading benchmarks has been bearish in the past 48 hours (not solely down to OPEC). Accompanying overtones describing the meeting as a non-event is the sentiment that OPEC is being haunted by North America’s shale revolution. As if with perfect timing, the US EIA announced on Thursday that the country's crude-oil supplies rose 3 million barrels for the week ended May 24, to 397.6 million barrels; the highest level on record since it began collecting data in 1978. Last week, the International Energy Agency (IEA) added its take on North American production scenarios by suggesting that demand for OPEC's oil is expected to plummet as production from the US (and Canada) increases by a fifth to 11.9 million bpd by 2018, compared with this year. Additionally, Iraqi production is returning to health. So to put things into context, by 2020 the IEA expects Iraq's oil output to more than double to 6.1 million bpd and were this to happen, OPEC’s unofficial production could rise well above 36 million bpd. As a knee-jerk reaction, the cartel – according to the agency – would have to withhold up to 2.3 million bpd from the market by 2015 (with its spare capacity rising well above 7 million bpd). Given all of this, you might be excused for thinking the global crude market was facing a supply glut and everything was gloomy from OPEC’s standpoint. Yet, the price of oil – Brent or OPEC’s own basket of crude(s) – is still above US$100 per barrel. That’s exactly where most in OPEC want it to be. Arriving a day (or two) ahead of the meeting, 7 out of 12 OPEC ministers have told various media outlets that a US$100 price was acceptable, where it needs to be and “necessary” for investment. These include senior government officials from Angola, Ecuador, Iraq, Kuwait, Saudi Arabia, UAE and Venezuela. A US$100 floor price is a uniting theme it seems and most have sounded intent on holding the current official production quota! The conjecture is that as long that floor is maintained, the cartel won’t be cutting production. In fact, OPEC kingpin and Saudi Arabia’s oil minister Ali al-Naimi, who has been in Vienna since May 28, has said existing conditions represent the best environment possible for the market in the face of economic headwinds and that “demand is great.” Despite the best efforts of scribes, bloggers, wiremen and analysts collective, neither Iran nor Venezuela, both of whom are always pushing for cuts to boost the price, have uttered much in the past 24 hours. The Oilholic thinks the cartel will maintain status quo until the floor dips to US$80 per barrel, if it does. However, the unity will disappear the moment the oil price dips below US$99 with Venezuela and Iran being among the first to start clamouring for another production quota cut. This brings us back to the hullabaloo about North American shale (and unconventional E&P) versus OPEC! The right wing commentators and the US media plus politicians of all stripes – some of whom of conveniently forget Canada’s part in the North American energy spectrum – make it sound as if OPEC, which still accounts for just over 40% of the world’s crude oil market, would suddenly become irrelevant overnight. The IEA, as the Oilholic noted a few weeks ago, described it as nothing short of a paradigm shift in the context of the oil market, although in not these exact words. Then there is the dilemma of OPEC ministers – who are damned if they do and damned if they don’t. If an OPEC minister acknowledges the impact of North American shale, he is described in the media as one who is resigned to the cartel’s decline. Conversely, if an OPEC minister dismisses it, the rebuttal is that he’s doing so because he’s scared! Now, instead of the Oilholic doing so, do your own research on how the quote has been reported stateside? It will vindicate the sentiment expressed in the previous paragraph. Yours truly is not belittling the shale revolution stateside – but how on earth can the current level of incremental production be maintained beyond the medium term is beyond common sense. So its worth getting excited about but not overexcited about it too! Furthermore, a bit of pragmatism is needed in this debate – one which the Oilholic saw in a brilliant article in the FT by Ajay Makan. In the column, Makan notes how within OPEC there is divide between the relatively comfortable Gulf producers (for e.g. Saudi Arabia) and the rest (most notably Iran, Venezuela and African members). The Saudis have welcomed the impact of shale as they can afford the price falling below US$100 level but some of their peers in OPEC can’t. For some more than the others, “a reckoning appears inevitable, particularly if growth in demand slows,” writes Makan. Then again, beyond supply scenarios, it is worth asking whose shale bonanza is it anyway? First and foremost it is, and as the Oilholic was discussing with Phil Flynn of Price Futures a couple of months ago, price positive for American consumers, followed by LNG importing Asian jurisdictions. While Indian and Chinese policymakers are hardly jumping for joy and will for the foreseeable future continue to rely on OPEC members (and Russia) for majority of their crude cravings, some in the US are already fretting about what US exports would mean for domestic prices! A group – America’s Energy Advantage – backed by several prominent US industrial brands including Alcoa, Huntsman chemicals and Dow Chemical, has claimed that "exporting proceeds of shale (to be read LNG) carries with it the potential threat of damaging jobs and investment in the US manufacturing sector as rising exports will drive up the price of gas to the detriment of domestic industries." Boone Pickens, in a brilliant riposte, has asked can the US do what it has been criticising OPEC for since the cartel's inception and restrict exports? The inimitable industry veteran has a point! That's all for the moment from Vienna folks! Keep reading, keep it 'crude'! © Gaurav Sharma 2013. 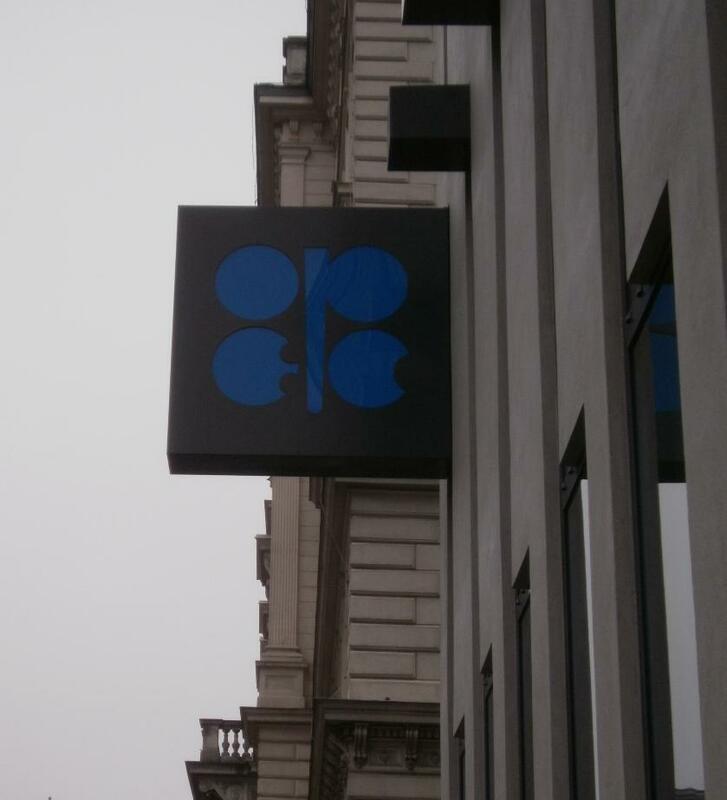 OPEC logo on HQ exterior, Vienna, Austria © Gaurav Sharma. As expected OPEC quota stays at 30 mbpd! UK Oil & Gas Inc. - The Thatcher Years!